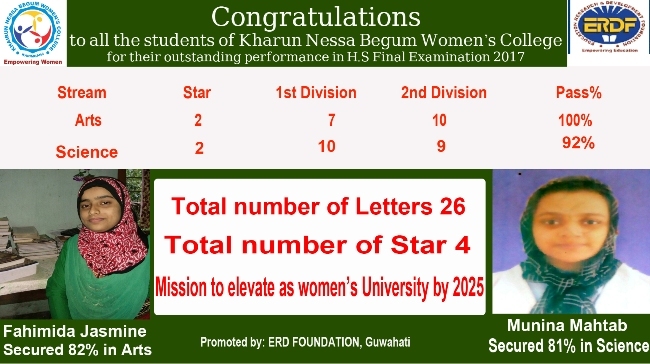 A30th May, 2017, ERDF : Khairun Nessa Begum Junior College (ERDF JUNIOR COLLEGE) a unit of ERDF Guwahati, has made its mark today and proved its journey towards excellence as Assam Higher Secondary Education Council (HS 12th RESULT 2017) results were declared today. The students of KNBJ had come out with flying colors at this year AHSEC exam having 100% passed-out in Arts and 92% in science stream. “This is not just extra-ordinary but exceptional instance if we consider the fact that Khairun Nessa Begum Junior College had started its journey last year and this was the first batch of students. I am extremely pleased with this outstanding performance of our students’- stated Sh. Mahbubul Hoque, Chairman, ERDF. Meanwhile, the KNBJC sources informed “ with this overwhelming performance by the first batch students, more and more queries by the parents, guardians of the students started pouring in and we are hopeful and the number of enrolment for this academic session 2017-18 will go up” . The principal of the college, Dr. Afsana Amin Soma also informed that they will be conducting counseling sessions at the campus as well at some remote places of the state in an attempt to spread our vision which is to create a world where all girls are empowered through quality education to realize their full potentialities & responsibilities, so that they can contribute to become a successful family manager & in the process make the society a better place to live in through participatory teaching learning process maintaining community and religious culture”. Worthwhile to mention, Khairun Nessa Begum Women’s College which is eighth venture of ERD Foundation had first started its academic session in 2015-16 to reverse the myth that women are not entitled to be liberated or educated. KNBWC, both Junior and Senior College, has set its goal to empower women specially the down trodden rural women belonging to minority communities. And for that education is the only powerful weapon through which they will be more conscious of their rights and thus attain self-reliance. Gone are the days when women were regarded as just subservient to their patriarchal lord and therefore they don’t need to be given education. As per record, the minority women literacy rate in Assam is only 40% and accordingly women’s participation is also very less in higher education. This decision of the foundation is encouraged by the recommendations made by the Committee on Girls’ Education, Ministry of HRD, Govt. of India.